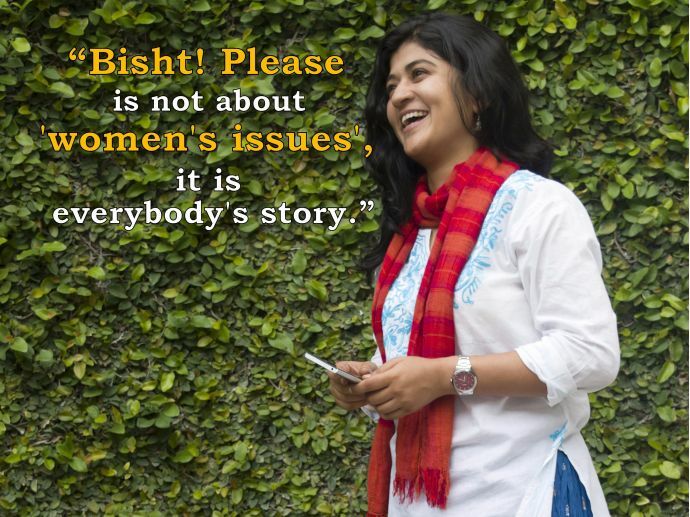 The creative maven at The Viral Fever will soon be seen in her own web show, Bisht! Please. Women in comedy are few and far between. Nidhi Bisht, Creative Director, writer and actor at The Viral Fever is one such talented individual. Part of TVF’s core team, Nidhi is best known to viewers from her act as Ek Thi Kapoor and Caller Naina, among other immensely popular TVF videos. Nidhi has come a long way from her stint as a lawyer in New Delhi, her hometown. Launching India’s first ever web series with a female lead, Bisht! Please, she has many interesting stories to tell about her web show, her work at TVF, her debut film Phillauri, and much more. Female characters who stand out in our memory are either larger than life, or quirky in a way that is very unrealistic. Neetu Bisht is a good girl who lives by the rules. How was this idea received by the rest of your team? Between me and Bisso (Biswapati Sarkar), who has also co-written and directed the show, it was clear that the story would have a female protagonist, but not necessarily be based on ‘women’s issues’. We kept in mind that the character should be such that either a man or a woman could play it, and the adventures would remain the same. Of course when you portray a gender, some nuances will come in. It is just set in a fun space. Our team was pretty comfortable with the theme. We believe that the content speaks for itself. So far in the industry, we have seen female characters portrayed very superficially. Rather than an insightful narrative, it always feel like a third person perspective. So there are stereotypes like women loving shopping, chatting, PMS. Women’s lives are not all about that. Like, women living alone in cities have this typical habit. A still from Bisht! Please. If a plumber, electrician or any such male stranger visits us, we usually stand at the door, as a precaution, thinking we’ll be able to escape if something untoward happens. Nobody has taught us this, but not many people know that women do this either. We too, wake up in the morning, haggle with autowallahs, go to work, struggle through life like anybody else. And we have hardly ever seen that on screen. When somebody brings out something that isn’t cliched, which challenges stereotypes, it clicks with the audiences. How similar or different is Neetu Bisht from Nidhi Bisht? Neetu is a ‘good girl’. Neetu is a less confident version of me. I think I’m a little more outspoken. There are similarities in terms of moral values, and in those terms, almost every girl will relate with Neetu. I feel the Nidhi from 7-8 years ago, would be more like Neetu. How comfortable are you watching yourself on screen? Well, we always have a degree of unease about how we look, so we are very critical of how we appear on screen. But sometimes there are moments when you feel, “Oh, this looks good”, or “I pulled that off well”, so it is mostly 50-50. Everybody has their own brand and sense of humour. Is there a certain apprehension that comes with introducing a new concept, about viewers finding it relatable? Our approach is never, ‘Will this work or not?’. We focus on creating a story that is fun to work on, and share. Usually it is the five of us coming up with different ideas, of which we zero down on one which sounds the most appealing. Then we start work on it. Worrying too much about what the audience will like is what has gone wrong with TV shows. Were finances a problem, at least during the early days of TVF? Resources were definitely an issue earlier. During Chai Sutta Chronicles for instance, the entire cast and crew consisted of four people. Biswapati and Naveen acted, Amit Golani was directing it and there was Anandeshwar (Dwivedi) who was holding the mic. When we didn’t have money, we would figure out some jugaad because work had to be done at any rate. A still from Chai Sutta Chronicles. scoopwhoop. Now that we have money, we don’t need to try hacks. But even now we are allotted very stringent budgets, and told phailo mat (be within your limits). All of us believe that when we are working within strict constraints, we deliver our best! 'Maa ke Haath ki Cigarette' was, according to us, one of your best videos. But you mentioned in an interview that it did not get the response you anticipated. What went into making that video? It was great fun making the video. Chandan, who wrote FATHERS, came up with the idea and we thought of giving it this nostalgic touch. It didn’t take long to shoot. Why didn’t it work? I think we were trying to say a lot of things in it, and that much layering was not needed. I know it is ‘critically acclaimed’, but didn’t win the masses. TVF has either produced content which is in comedy space or your normal slice of life. Any plans for creating hard hitting, serious content? Yes! In fact, the lineup for this year mostly consists of shows. We are trying to explore all possible genres, maybe even create new ones. So yeah, we want to do everything. Comedy was the caterpillar, drama is the butterfly. This year’s lineup is quite the cocktail so viewers will get to see a lot of variety. Competition or cooperation with other digital content creators? Is there any kind of animosity with them? It is a community. If a video by All India Bakchod performs well, it is good for all of us because it means more people are turning to the Internet for entertainment. Of course, there is a fair amount of competition which is necessary for growth. You must have noticed when Vipul (Goyal) was doing Humorously Yours, many stand up comedians you associate with other channels, like Zakir Khan, Tanmay Bhat, Kenny Sebastian made appearances. Ideally, each one of them would’ve wanted a show of their own. But seeing how this show was important for the whole stand up industry, they did these cameos. One’s success translates to success for others too. Do you envision a complete shift to fast moving content (of the kind TVF produces) from TV in the coming time? I think Ekta (Kapoor) would be the best person to answer this. I don’t think TV will ever go out of vogue. I loved the TV as a child and our USP, in fact, is trying to make content of the kind we saw on television say, 25 years ago. It’s all about telling good stories, and in our stories, nobody poisons your milk, nor does anybody turn into a snake at night. Our taste have been spoiled, and it is up to us to salvage that as well. A lot could change if people writing for TV would watch their own content. I don’t think their schedules allow for that. I mean with 18-hour schedules, daily submissions and the compulsion to speak your mind in 140 characters on an hourly basis, where is the time to watch? We love watching what we make, sharing it with people and asking for feedback. I do hope TV folks do that as well. Now that TVF is venturing into films, how do you think it will change the way of how women are portrayed on screen? Given that you guys are termed as the most progressive of the lot, you’re more informed. I can’t say how it will bring about change, but I think from our end we have always tried to portray women in a progressive light. I often say that in our stories the girls are smart and the boys, not so much. Mikesh (Sumeet Vyas from Permanent Roommates) is goofy, but Tanya (Nidhi Singh) is intelligent. Shreya (Maanvi Gagroo from Pitchers) likes Naveen (Naveen Kasturia), and so the rest of us like Naveen. The people we know, hang around with, spend time with are generally like that, and our effort to show real, relatable characters, both men and women, seems to click with the audiences. So this is what we’ll continue to do with our movies as well. March is important for you for more than one reason. Apart from Bisht! Please, your film Phillauri is also up for release, how was the overall experience working on it? It is the second film by Anushka and Karnesh (Sharma). It is a period film, and scale-wise it is huge. It was my first time working in such a big project. Anushka and Karnesh are wonderful people. They are rich, yes, but we share a similar upbringing, both hailing from modest North Indian families. All I expect from people is courtesy and amiability, and these people made me feel like a star! The theme is quite novel, the cinematography is by Vishal Sinha who also shot Raanjhanaa, so the film is visually stunning too. My role in the film was in the pre-Independence part of it. We shot in the remote areas of Punjab at the peak of summer. I play Anushka’s friend and Abhishek Banerjee, who takes care of Casting at TVF, plays Diljit Dosanjh’s friend. So it was like being on a paid holiday. So this March is very important. I have to file my tax returns and then this! Bisht! Please will be released exclusively on TVFPlay on March 31, 2017.